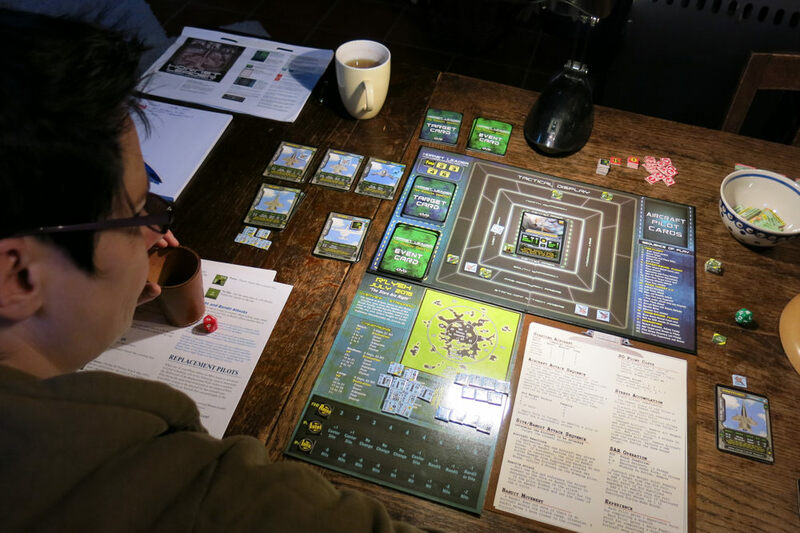 We love aviation wargames like Thunderbolt Apache Leader (GMT) and Hornet Leader (DVG), especially since these solitaire games can also be played cooperatively by two players. And we are notorious for our special interest in coop gaming! 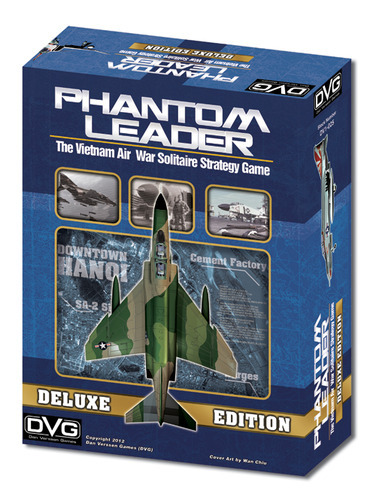 We were looking forward to playing Dan Verssen’s Phantom Leader Deluxe, a game portraying the Vietnam air war (actually beginning with the Cuban Crisis), part of DVG’s Leader Series, and when the game entered our HFC Test Lab, we were very happy to find out that this implement of the Leader Series works as excellent as a cooperative game as it does as a solitaire game – as do the other games of the Leader series, despite the fact that this additional option isn’t mentioned anywhere in the rules or on the game box. Phantom Leader Deluxe is an update to DVG’s original Phantom Leader from 2010 (re-worked in order to adjust it to the standards set by Hornet Leader). So the new game version is adding more aircraft, the Cuba mission, making adjustments to the campaigns, adding more pilots for each aircraft type to choose from, more targets and more Event cards. All in all, more content and more options, so switching from the original Phantom Leader to the Deluxe Edition is certainly worth the money, if you are a fan of the game. There are tons of new stuff compared to the original version, and the new stuff isn’t just for show or chrome, but really adds to the experience and variety. So what’s the game about? In Phantom Leader, you take command over a tactical fighter squadron. You can choose between playing as US Navy or US Air Force, which offer different aircraft types and pilots. 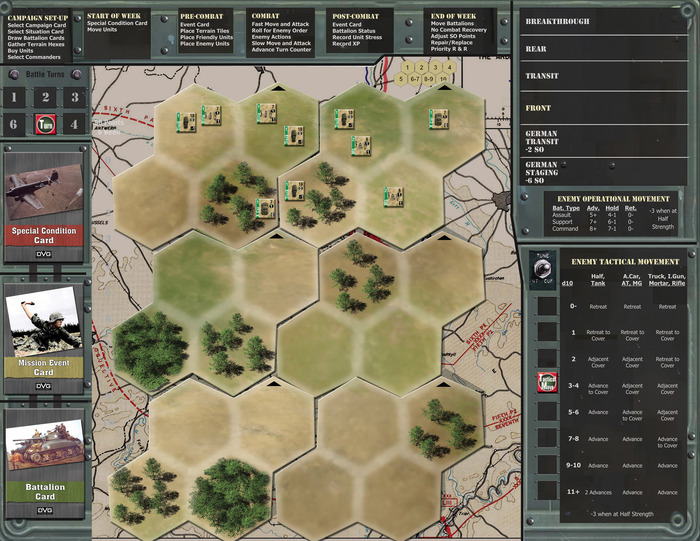 All four campaigns come in two versions: as US Navy campaign and as US Air Force campaign, which doubles the tactical and strategical options, and lets you find out who does a better job. 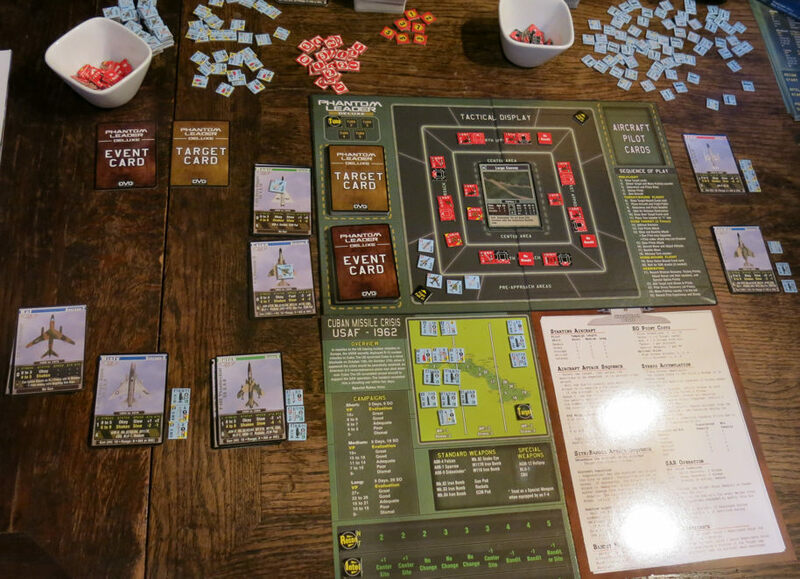 The game includes four campaigns, starting with the 1962 Cuban Missile Crisis, followed by the 1964 War in the South campaign, 1967 Rolling Thunder, and finally 1972 Linebacker. You don’t have to play the campaigns in chronological order, and in the basic game, they are not linked with each other. There is an optional rule which allows you to play them as a large combined campaign, though, but normally, you pick only one campaign at a time. Each campaign consists of a variable number of “missions” (scenarios or targets you will attack), so you can play each campaign as a short, medium, or long campaign, as your time allows. In addition, you can adjust the difficulty level of the campaigns to your experience and play style. Since the flight missions are determined randomly, as are the enemies you will face in the combat area, this concept ensures a high replay value. At the beginning of a campaign, you choose the members of your fighter squadron (you cannot choose aircraft which were not in use at the year the campaign takes place, of course). Then, you start with your first mission where you learn what your target is, where it is located and how heavily it is defended. You then get the chance to load your fighters with various weapons and gadgets. After the briefing, your squadron takes off towards the target. Random events (triggered by cards) as well as randomly placed enemy defensive units will make it harder for you to reach the target zone. Enemy units consist of various kinds of units – ground units like infantry, anti-air sites, and air units (enemy fighters which try to force you into a dogfight). Once you managed to reach the target, you have to fulfill the mission objectives which are detailed on the current target card. Objectives vary, depending on the kind of target, and will sometimes surprise you. After fulfilling the objective (usually by destroying a target or various targets), you will have to steer your fighters out of the combat area and back to base. If a fighter was shot down, there is a chance that the pilot survived, so you will also have the chance to rescue him in a Search-and-Rescue attempt. The last part of the mission is the debriefing step, where your performance and the pilots’ stress levels are recorded. Missions can be quite stressful, so it is possible that your pilots will be unfit for the next mission after returning to their base. Since a campaign consists of several missions in a row, and you only have one fighter squadron, one of the main challenges of the game is to think about when to use which pilot – you always have to keep in mind that they could be shot down or suffer too much stress to be useful in the following missions. This adds a strategic level to the otherwise tactical gameplay of flying single aircraft into a combat zone where they will be attacked by enemy units and dogfighting other fighters. In Phantom Leader, you don’t have to learn how to pilot an aircraft (your chosen pilots are perfectly capable of flying them without your assistance, so this isn’t your problem). You are the leader and mission commander back at the air base who tells each pilot where to fly, when to fly, and which loadout to take into combat. So if you find your fighter squadron horribly wrong equipped against the target or the encountered enemy units, and they are shot down or so stressed that they are sent into the med bay afterwards, this isn’t their fault – it’s yours. A bad mission outcome and failure to achieve the mission objectives is almost always caused by bad planning, wrong equipment, and wrong decisions. And some bad luck, of course, because the game contains many random elements which change from mission to mission. You cannot influence which defensive units appear at the scene or which surprise events make your life harder. But you can influence bad luck in rolling your dice by choosing the right equipment, pilot constellation, and flight maneuvers. Like in a RPG, your pilots gain experience points when flying on a mission, and have the chance to level up to the next higher skill level (at least in a medium or long campaign). Levelling up has significant impact on the various stats of a pilot. 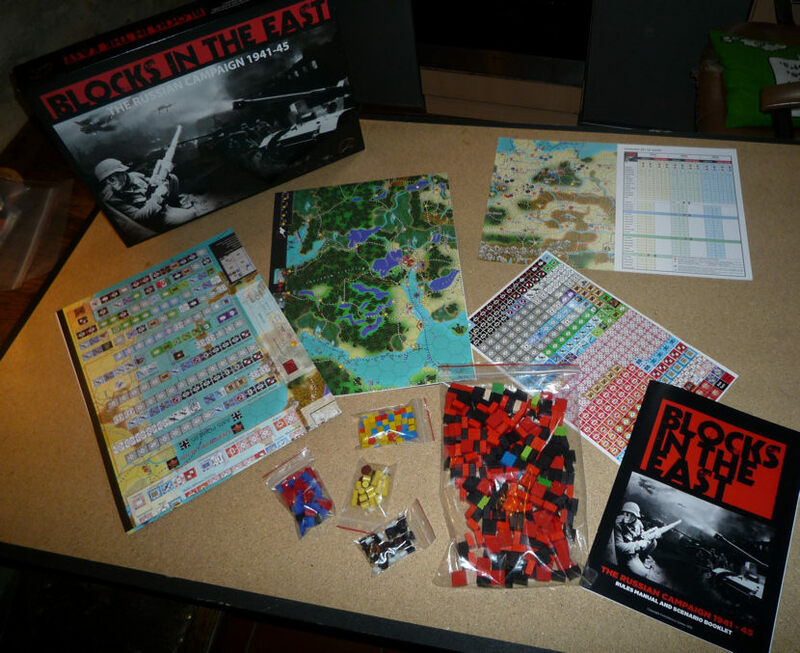 The components within the heavy game box are of a very high quality (as it is with all games of the Leader series). The box contains a full-colored rulebook, a 10-sided die, lots of counters, cards, and markers. The overall game style is modern and visually appealing. 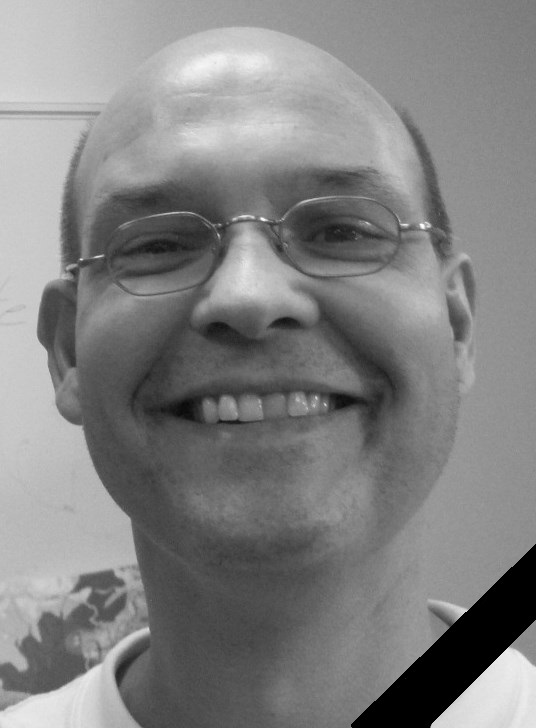 MMP in preparation for the…eASLRB!!! 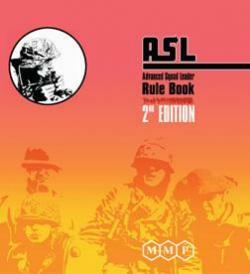 Yesterday we heard about the reprint of Up Front – The Squad Leader Card Game, unbelievable as it is, it seems to be true. It seems that MMP has a different opinion about this now and this is really good news, so we can expect a professionally produced eASLRB in the hopefully near future. You can find the announcement on the CSW and GamesSquad forums. 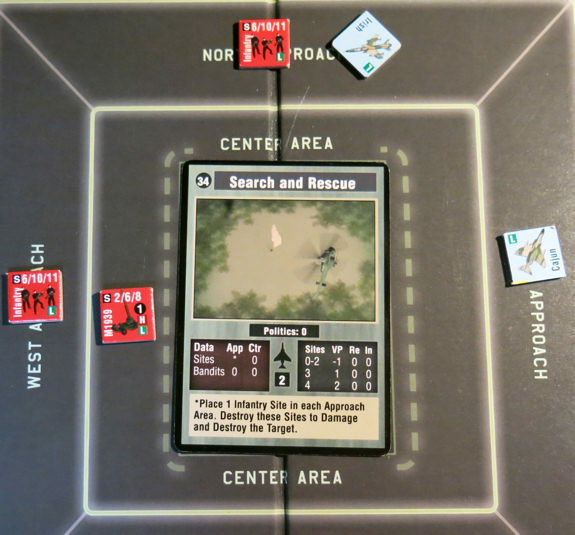 We are big fans of Thunderbolt Apache Leader (GMT), so we were looking forward to Dan Verssen’s Hornet Leader – Carrier Air Operations, the latest game in DVG’s Leader Series. 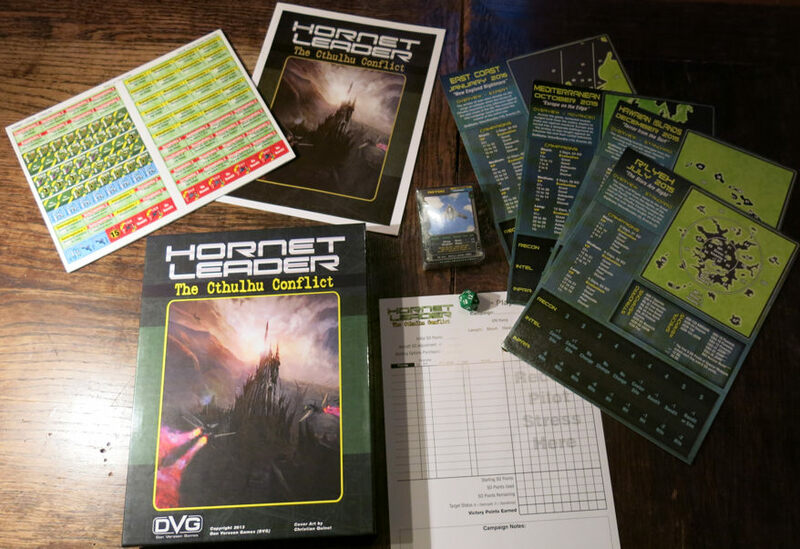 Believe it or not, the "Solitaire game" Hornet Leader is one of the best cooperative wargames ever! We are also notorious for our special interest in cooperative games, so we were really delighted when we discovered that Hornet Leader (HL) isn’t only an excellent solitaire game but also a very challenging 2-player cooperative game experience which requires much teamwork, planning, and tough decision-making. In Hornet Leader, you are in command of a Navy aircraft squadron, stationed on an aircraft carrier. 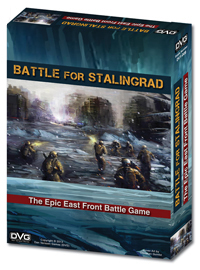 The game is scenario based and offers historical and hypothetical contemporary scenarios ranging from Libya 1986, Iraq: Operation Desert Storm 1991, Israel Defense 2003, North Korea 2007, Taiwan Defense 2008 up to WWIII North Atlantic 1986, Taiwan Defense 2008, Russia 2012 or Iran 2014. Scenarios (“Campaigns“) come in various difficulty levels, ranging from introductory to expert. You can also “tweak” all scenarios if you want them to be easier or more challenging by adding “advantages” or “disadvantages”. In addition, you can choose to play each scenario as an US Navy or US Marines squadron which means that you have different aircraft at your disposal (because Marines carriers are smaller and operate closer to the shoreline) and different rules regarding the target zones of your attacks. You can also play each Campaign as a short, medium, or long campaign, depending on how much playing time you have at your disposal. Combined with the fact that you face different enemies each time you play the scenario, this system ensures a very high replay value. The main objective of the game is to fly “Missions” where you destroy enemy ground units, for example tanks and convoys, stationary installations (Radar stations, factories) or fight enemy fighter squadrons or fleets. There is a large variety of available targets which have different special traits as well as variable numbers of protective ground units and/or fighters. Some are easy to destroy, some are tough nuts. Some can be destroyed in addition to a primary mission as a secondary target. Each destroyed target is worth a certain number of Victory Points, so you have to pick your targets carefully. The game is an interesting mix of card game with a game board (“Tactical Display Sheet”) and counter system. Aircraft are represented by cards (and counters while flying a mission), their weapons are counters. 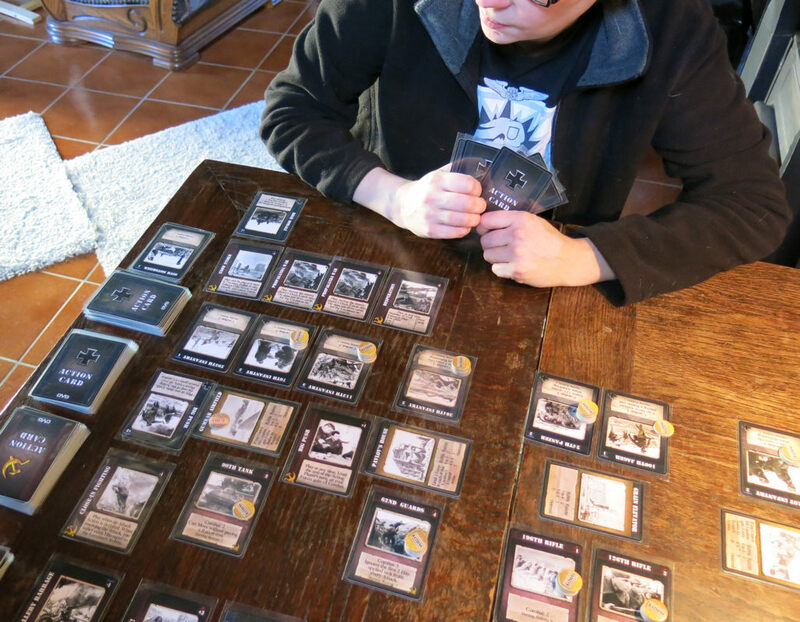 Random events and the composition of enemy forces are determined by card draw, the main target is represented by a card, but you fight ground forces and enemy aircraft which are randomly drawn counters on the Tactical Display Sheet. Hornet Leader is a game with a very high heft factor: the heavy box is crammed with high quality components such as a mounted (!) 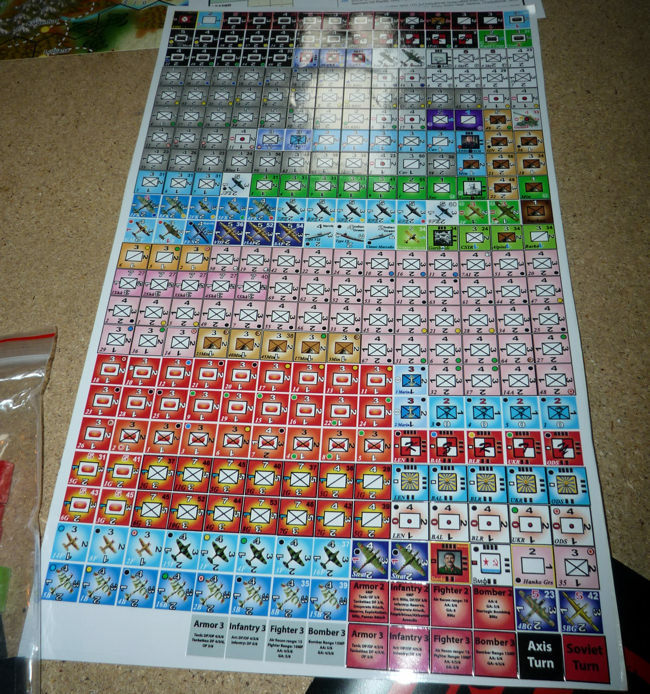 map-board, various counter-sheets, card-packs, a full-color rulebook and more. This big gamebox isn’t a bluff package (like what you probably know from some other game publishers, big boxes filled with little stuff and much cardboard), here you get a heavy box full of cool stuff for your money. The overall production quality is very good. The counters are of a thick, sturdy quality and with a nice glossy coating which gives them a very attractive look and a great feel. It’s not a problem to punch the counters from the counter sheets, they are accurately pre-cut without being too loose (so that they would fall out of their counter sheets during shipping). The full-color cards are also of a very high quality and glossy. The artworks are really cool and add much chrome to the game. There are various types of cards – Aircraft, Target cards, and Event cards.